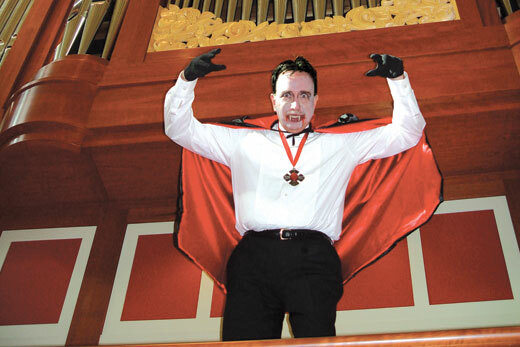 University organist, Timothy Albrecht, returns as Count Dracula in Scary Ride on Saturday, Oct. 27 at 8 p.m.
Music at Emory celebrates autumn with seasonal concerts, student ensembles, and violinist Gil Shaham. All performances will be in the Schwartz Center for Performing Arts unless otherwise noted. Say "guten tag" to the Oktoberfest Band Concert on Thursday, Oct. 4. This musical treat will be in Jenkins Courtyard of Goizueta Business School starting at 4:30 p.m.
Join the Emory Jazz Combos for Jazz on the Green, Thursday, Oct. 4, 6 p.m. and Oct. 18, 6 p.m. Enjoy a relaxing evening of outdoor jazz on Patterson Green, located between the Schwartz Center and Goizueta Business School. 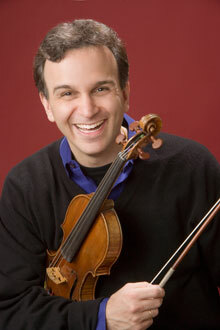 Gil Shaham is one of the foremost violinists of our time, combining flawless technique with inimitable warmth. Shaham will explore several of Bach's sonatas and partitas for solo violin on Thursday, Oct. 4, 8 p.m. This concert is part of the Flora Glenn Candler Concert series. Tickets: $60; $48 discount category; $10 Emory students. On Sunday, Oct. 7 at 7 p.m., Emory physicist Sidney Perkowitz and the Vega Quartet will explore the relative connections between science and music in String Theory at the Planetarium, located in the Math and Science Building. Chamber Music by the Affiliates is Sunday, Oct. 7 at 4 p.m. The repertoire includes works by J.S. Bach, Clara Schumann, and Bohuslav Martinü. The Emory Chamber Music Society of Atlanta presents Mozart's Clarinet Quintet with Laura Ardan and the Vega String Quartet on Friday, Oct. 12 at noon in the Carlos Museum Reception Hall. The Atlanta Sacred Chorale, with director Eric Nelson, premieres its 28th season with a program entitled "It's About Time." In an evening of exquisite choral music, explore how our experiences are affected by that mysterious yet ubiquitous phenomenon we call "time." Tickets: $20; $15 discount category; $10 Emory students. On Monday, Oct. 15 at 8 p.m., the Atlanta Youth Wind Symphony shares the stage with nationally renowned community band Tara Winds, conducted by Andrea Strauss. The Emory University Symphony Orchestra's season opens with Copland's energetic "Hoe Down" from his ballet "Rodeo," as well as Rachmaninoff's Symphony No. 2 in E minor, considered one of the greatest neo-Romantic works in the orchestral literature. Saturday, Oct. 20, 8 p.m.
Bring the family to Beethoven in Bluejeans on Sunday, Oct. 21 at 4 p.m. Presented by the Emory Chamber Music Society of Atlanta, the concert will be in the Carlos Museum's Reception Hall. Keiko Ransom presents a piano recital on Sunday, Oct. 21, 7 p.m. The program includes "Death Angel" by faculty member John A. Lennon, "Chromatic Fantasy and Fugue" by J.S. Bach, "Nocturne in E Major, Op. 62 No. 2" by Chopin, and "Sonata in B-flat Major, K. 333" by Mozart. On Friday, Oct. 26 at 8 pm, the Emory University Wind Ensemble and University Chorus join forces in a concert of innovative music for wind band and chorus, including the hot-off-the-press "Meridian" by Atlanta composer Ola Gjelio (YAY-lo), the moving "October" by Eric Whitacre, and some Disney favorites from "Mary Poppins" and "The Jungle Book." Get ready for Scary Ride, on Saturday, Oct. 27 at 8 p.m. University organist Timothy Albrecht returns as Count Dracula with Halloween organ music, and scenery that is sure to fright and delight. A candy reception follows the concert. The Emory Concert Choir presents a concert Sunday, Oct. 28, 7 p.m. The program features "Requiem," John Rutter, "There Will Be Rest," Frank Tichelli, and Ola Gjeilo's "Dark Night of the Soul" with Vega String Quartet. October closes with a performance by Ed Nicholson, trombone. The program features music by Lars-Erik Larson, Vivaldi, Mahler, and Led Zeppelin, with Todd Qualls, piano.